Please remember that there is a great Jazz gig every Friday at Monte’s starting at 5:30 there is never a cover charge and the bands rotate from week to week and features some our best local musicians. Also at Monte’s this month on Valentine’s Day, February 14th at 9 PM The Montreal-based Fieldtrip Trio plus 2 will be passing through. Filedtrip Trio has been in Kingston a number of times over the last several years . This time around they will be joined by two exceptional musicians in guitarist Jim Head from Edmonton and tenor saxophonist Online Casino Kelly Jefferson. Anyone who hasn’t heard either of these two guys play will testify to their work ethic and fearless exploration of musical boundaries. The Kingston Jazz Society will be presenting the Elizabeth Shepherd Trio in the Wilson room at the downtown public library on Sunday the 22nd of February at 2 pm. as part of our “Live@Your Library” Sunday afternoon series. Elizabeth has just received a Juno nomination as jazz vocalist of the year and has become one Canada’s best known jazz musicians in Japan and Great Britain. Tickets are $15 and are available through the Grand Theatre box office (613-530-2050) and at the door. There’s some great music coming up in January, starting with Monte’s Friday afternoons from 5:30 to 8:00. January 9th brings the energetic and hard-swinging trio of Jonathan Stewart, Mike Perlin, and Rob Radford on sax, bass, and drums. January 16th features Spencer Evans with Zak Colbert and Chris Smirnios. January 23rd guitarist Dave Barton brings a quartet with Chris Smirnios, Mike Perlin, and Jon Stewart. January 30th Sarah Hamilton and her husband David are back with Zak, Chris, and Jon. Also this month, don’t forget to mark down January 17th in your calendars. Local composer/arranger/band-leader Greg Runions is bringing his 17 piece jazz band to the Wilson Room at the Online Casino Kingston Public Library. This show will feature new works by Greg and local musicians and long-time collaborators Dave Barton and Jonathan Stewart. Greg is also bringing celebrated composer and trumpeter Joe Sullivan from Montreal. Joe has been a fixture on the Montreal jazz scene as an educator and musician since moving there after completing his studies at the famed New England Conservatory. I will send out a specific event invitation with more information about this great show. Of course, January also startes the Live @ Your Library series by the Kingston Jazz Society, again in the Wilson Room. The series begins on January 25th with Matt Wilson, John Geggie and Nancy Walker. Monte’s is hosting a special night of music on Saturday, December 27th starting at 9:00 P.M.
Joe Wright and Steve Piticco lead Viagra on guitar, with Zak Colbert on bass, and Chris Smirnios on drums. Support yout local music scene! I just heard some disturbing news. There is a rumour flying around suggesting that the new management at Monte’s is not sure about keeping the jazz on Friday afternoons after the holidays. Considering this is the only regular jazz gig going on in the city right now this would be terrible news. If we don’t want to lose it we better get down there for the next couple of weeks to support it. Friday (Boxing Day) see Sarah Hamilton and David supported by Zak Colbert, Chris Smirnios and myself. As always the Friday shows go from 5:30 to 8 and are FREE. 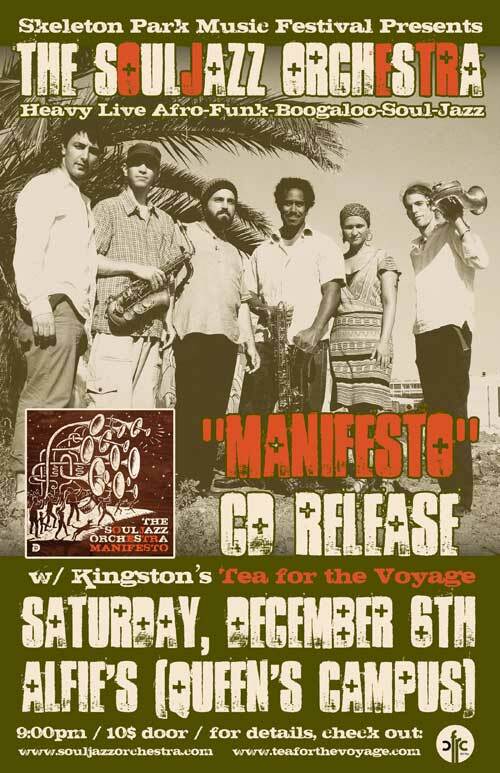 Please try and make it down to the show to show your support for jazz in Kingston. The Soul Jazz Orchestra is coming to Alfie’s on Saturday, December 6th at 9:00 Buy Cialis P.M. The Kingston Jazz Society is a non-profit charitable association of jazz lovers dedicated to the five p’s: preservation, production, performance, promotion and perpetuation of this distinctly North American art form. Fortuitously located on the Levitra Trans-Canada highway between Montreal, Toronto and Ottawa, the KJS has hosted some of Canada’s best-known and most revered jazz artists. They come to Kingston because our audiences know and appreciate this extraordinary art form.